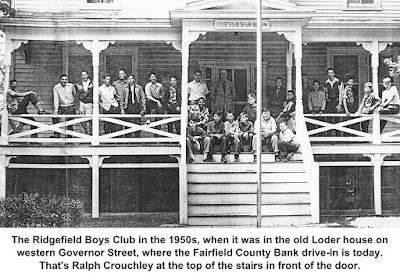 Crouchley was the director of the Ridgefield Boys Club during a period when it went from a small operation in an old house to a modern, well-equipped building on Governor Street, before it became the Boys and Girls Club. Born here in 1904, the son of a selectman and grandson of a first selectman, Ralph Bishop Crouchley graduated from the private Ridgefield Boys School and Colgate University, and studied at Harvard Business School before joining the Corn Products Refining Company. In 1930, with no knowledge of Spanish, he was sent to Mexico to open and operate a factory. He learned the language and succeeded at establishing and running the factory, but by 1936, travel was taking a toll on his family life and he decided to return with his wife and children to his hometown to run his father’s paint and auto store on Main Street. In 1942, the Boys Club had been closed for several months because of personal and financial problems. Francis D. Martin approached Crouchley and asked him if he’d be interested in reopening the club. He was. Crouchley began as the part-time director, but the job soon became full time. 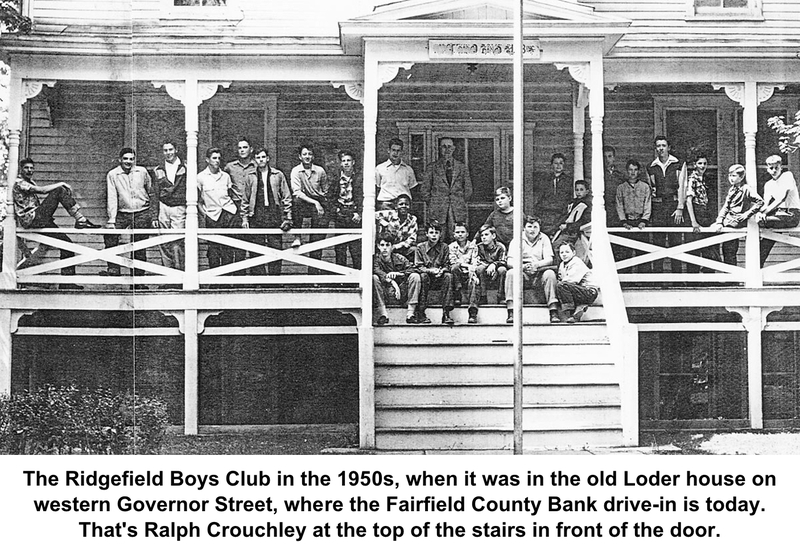 The club back then was located in the old rooming house about where the Fairfield County Bank drive-in is now on Governor Street. However, interest in the club under Crouchley’s leadership soon increased enough that money was raised to build a modern clubhouse farther east on Governor Street, site of the present building. His influence on two generations of young men of the community was almost legendary, and he won much praise and many awards for his work. He retired in 1969, but continued many other community interests. Over the years he was a president of the Ridgefield Volunteer Fire Department, member of the Board of Assessors, served on the Ration Board in World War II and was disaster chairman for the Red Cross, became the town’s first zoning enforcement officer, was a charter member of the Kiwanis Club, and was named an incorporator of the Ridgefield Savings Bank. He died in 1981 at the age of 76. Crouchley’s name lives today in the fond memories of many ex-boys for whom he was a mentor. 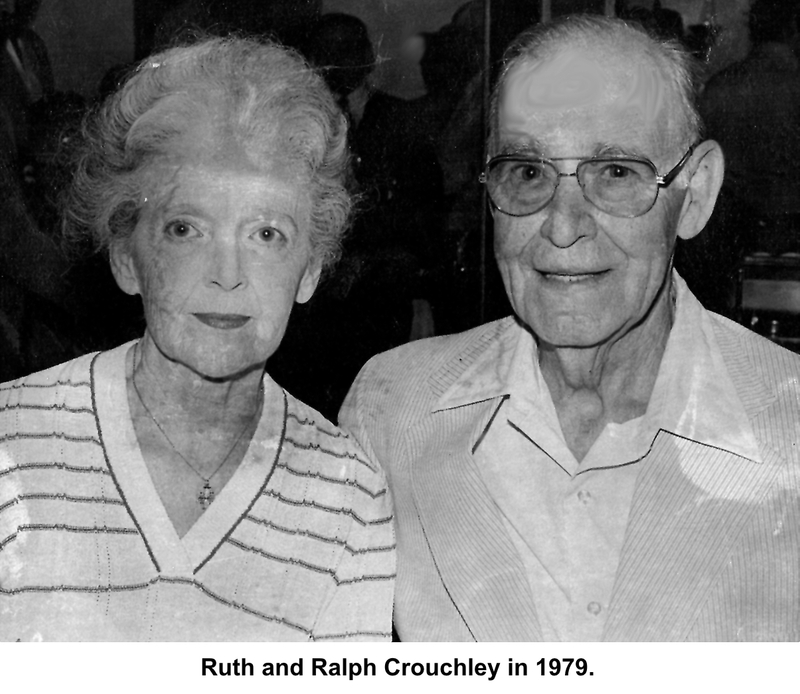 It’s also recalled each year in the Ralph B. Crouchley Boys and Girls Club scholarship, awarded at Ridgefield High School.